The R8100 and R8000 comprehensively support every major LMR protocol. Our test suites for both P25 Phase 1 and 2 are fully compliant with the TIA/EIA specification and employ every modulation and test pattern called out in the specification. And our P25 Phase 1 trunking option allows the test set to emulate a base station and trunking controller. 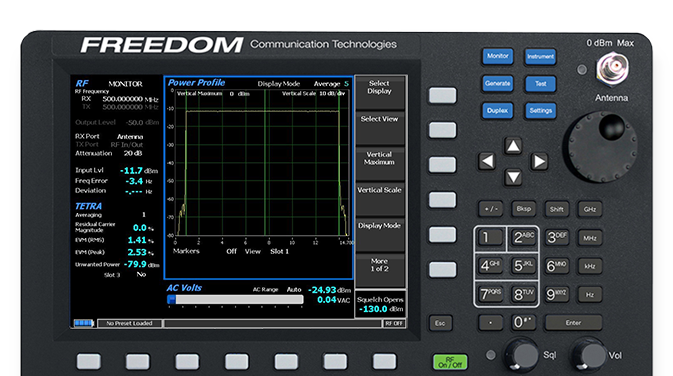 Our analyzers also lead the way in testing the new 6.25kHz and 6.25kHz channel equivalent technologies. Our NXDN and DMR test modes fully conform to the applicable specifications. NXDN “Type C” Trunking simulates the functions of an NXDN central controller. We also feature the industry’s most complete TETRA test capability with TMO and DMO subscriber, Base Station Monitoring and Base Station T1 Test options. 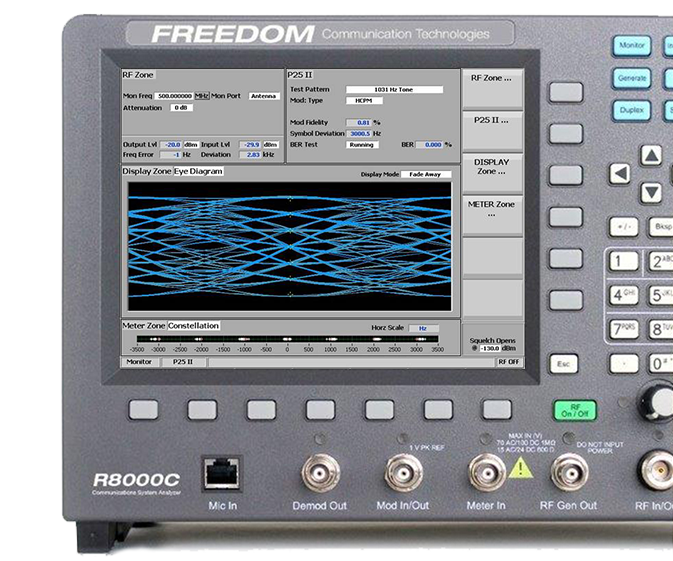 PTC testing on the R8100 and R8000 supports Physical layer testing of ITCR PTC radios used in theI-ETMS® (Interoperable Electronic Train Management System). 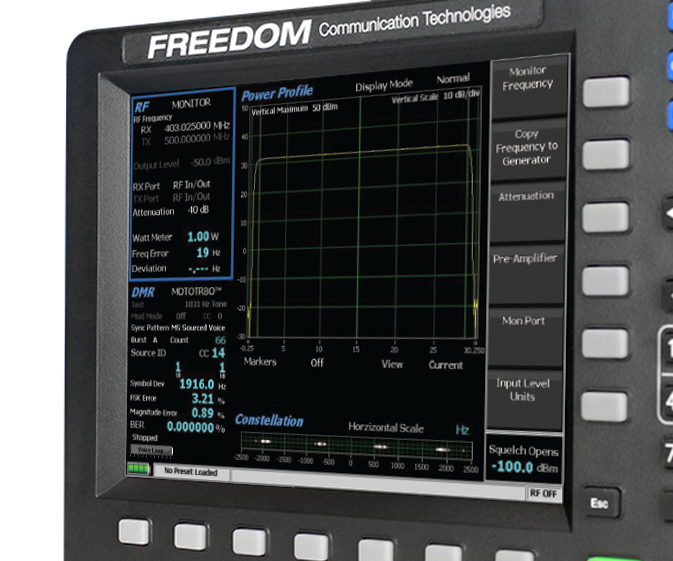 FREEDOM Communications System Analyzers provides comprehensive test support for Project 25 systems. 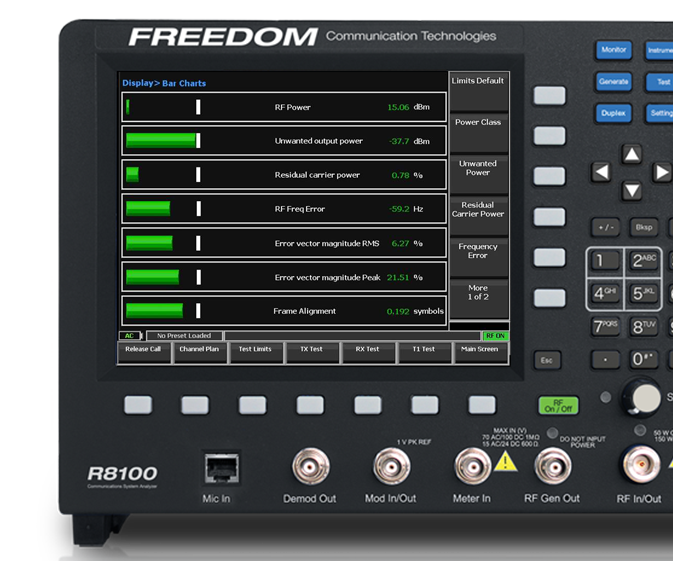 The R8100/R8000 allows full testing of P25 subscriber radios and infrastructure. Options allow testing of P25 Phase I and Phase II systems. A core set of features that allow testing of P25 Phase I systems. 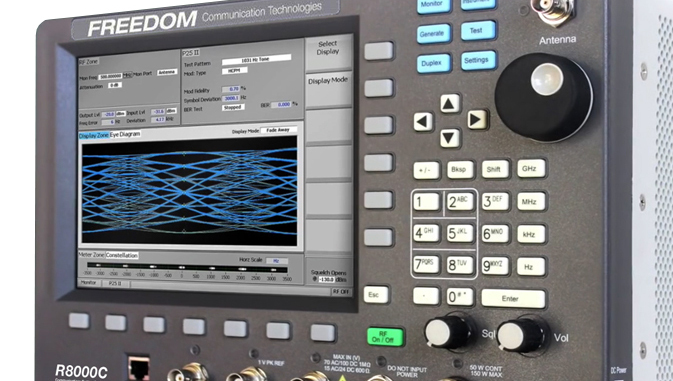 Support for measurements of C4FM and complex modulation formats allow testing of subscribers and infrastructure. Measurement of modulation fidelity lets you know the quality of your transmitter and Error Vector Magnitude (EVM) measurements allow advanced measurement of simulcast base stations. Inclusion of P25 Standard test patterns such as the 1011 Hz Tone and O.153 pseudorandom sequence permit testing sensitivity of a P25 radio. Also included is capability to enter signaling information and decode voice frame information allowing users to test proper configuration of a radio or test a live conventional repeater. The P25 trunking option enables the R8100/R8000 to become a base station emulator and trunking controller. Default Frequency plans for the VHF/UHF, 700 MHz and 800 MHz bands are provided. 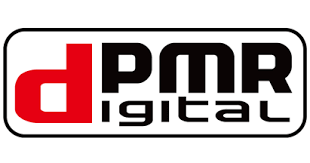 The user may modify these plans as needed for channel bandwidth, duplex offset and the bands base frequency offering a complete and comprehensive test solution for all P25 trunked systems. Test functions include: Control Channel Idle, Registration Request, Registration Grant, Traffic Channel Request/ Grant, Voice Channel audio paths, including encryption if fitted, with Voice Loopback, Incoming call alert tone, and Voice call (1011Hz Tone). The R8100/R8000 features a Test option that allows testing of radios compliant with the ETSI Digital Mobile Radio (DMR) Tier 2 standard. The unit measures Bit Error Rate (BER) for O.153 and 1031 Hz test patterns, as well as RF input power and frequency error in both digital and analog modes. 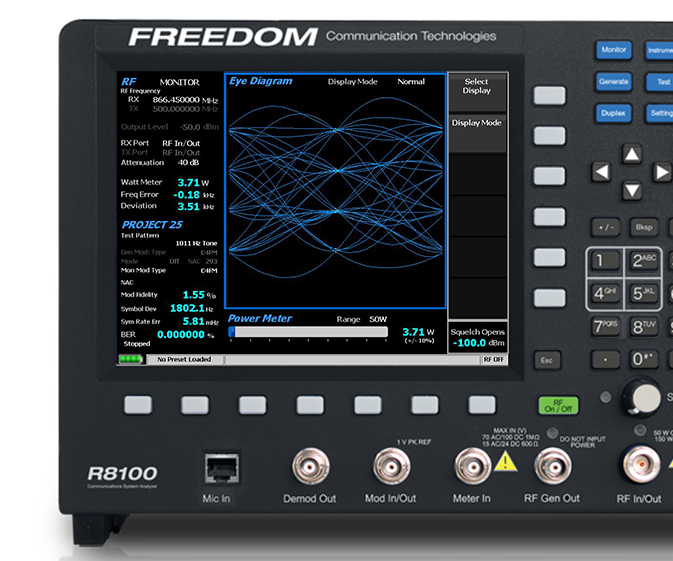 The R8100/R8000 can measure voice and data patterns sourced from subscribers or base stations. Also, the R8000 can generate an idle pattern for live testing of radios requiring a base station reference before transmitting. 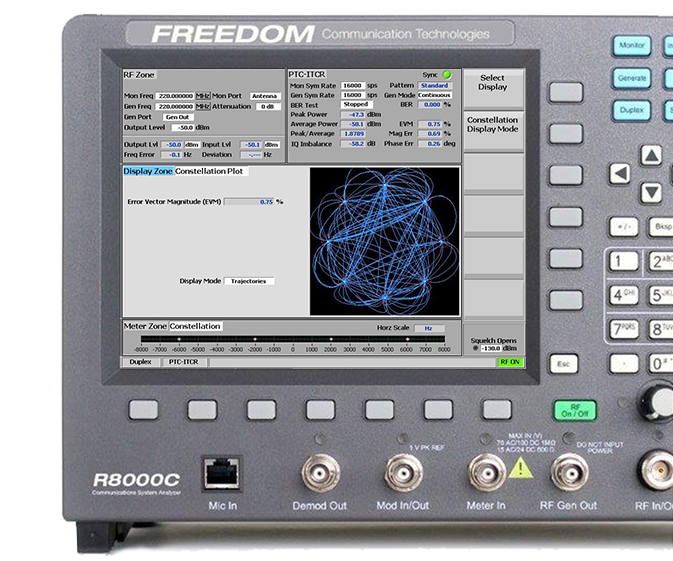 The R8100/R8000 NXDN mode provides a suite of test functions fully compliant with the Conformance Test section of the NXDN Common Air Interface (CAI) standard. These include Symbol Deviation, Modulation Fidelity, BER, Frequency Error, and Power. This option also features the Voice Loopback feature used to provide audio verification of the radio’s end- to-end operation. For users maintaining subscribers for a NXDN system using Type C trunking, the R8100/R8000 provides emulation of an trunking base station to allow simulation of voice call transactions. 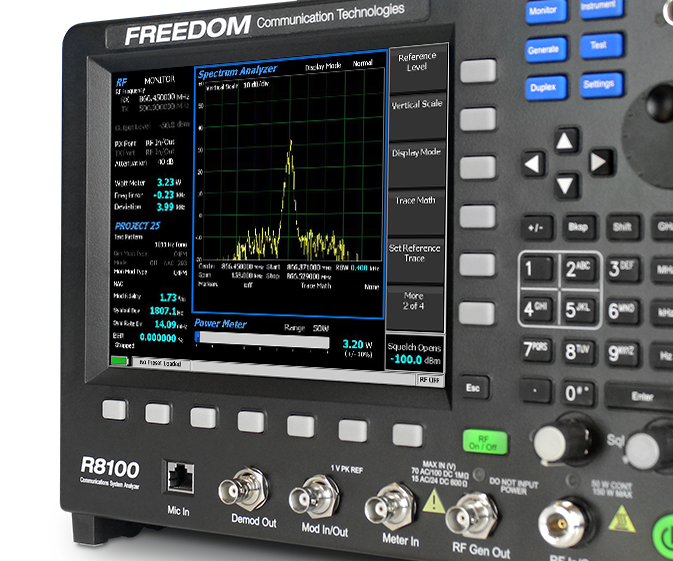 When the radio is moved to a traffic channel, the R8100/R8000 will measure the signal quality of the radio. The TETRA option allows quick RF performance testing of TETRA radios with a Direct Mode Operation (DMO) channel. Modulation performance can be evaluated using Error Vector Magnitude (EVM) measurements and viewing a constellation display. Receiver performance can be tested using a 1000Hz test pattern. 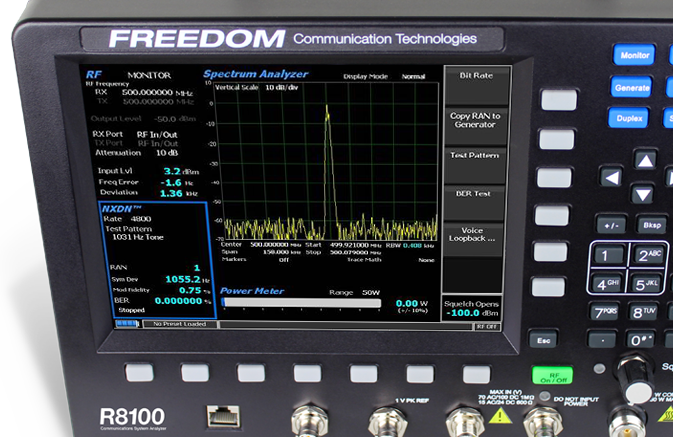 Freedom’s TETRA Trunked Mode Operation (TMO) test option provides the industry’s only comprehensive TETRA test capability in a fully portable analyzer. Full screen spectrum analyzer, constellation diagram and power profile displays facilitate signal quality analysis. Color-coded test results allow instant pass/fail analysis using either the default ETSI standards or user-defined test limits.